Because they are causing you pain! Myofascial trigger points are balled up areas or "knots" in the muscles that create pain. Everyone has them, but in some people, they become extremely painful and debilitating, creating constant or episodic pain. In other people, they are only tender when pushed, but create stiffness. 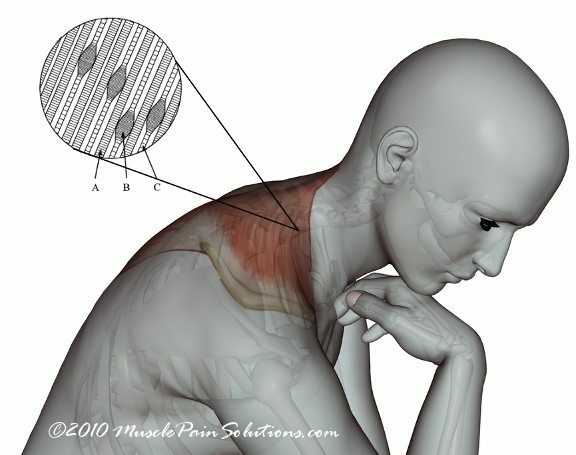 How do myofascial trigger points create pain? A trigger point is like a part of the muscle "stuck" in contraction. The continuous contraction prevents blood flow to those parts of the muscle, creating pain. This pain is due to lack of oxygen and a buildup of waste products. Muscle trigger points create pain that can be local (around the area of the trigger point), but more often is referred to distant areas in the body. The pain signals that a trigger point creates, get mixed up in the spinal cord with signals from other areas of the body so it "feels" like the pain is coming from somewhere else. 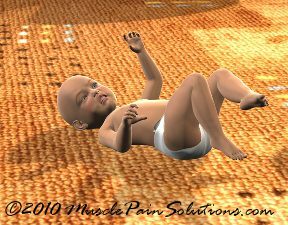 They can also create other responses such as muscle twitching, goose bumps, or even nausea and dizziness. The stiffness is caused by the muscle not being able to lengthen due to a trigger point in the fibers of the muscle. What does a myofascial trigger point look like? Below, you can see an image that shows a trigger point enlarged. A shows a normal fiber. B shows the shortened balled up area in the trigger point, and C shows the over stretched part of the fiber that creates the shortness and tightness in the muscle as a whole. (Adapted from The Trigger Point Therapy Workbook by Clair Davis). How do you find myofascial trigger points? A trigger point can feel like a half cooked pea or a knot under your fingers in the belly of the muscle. The muscle can jump under your fingers when you strum them over a myofascial trigger point. Central trigger points are at the exact center of a muscle fiber, which makes it so they occur in predictable places in each muscle. However, figuring out which trigger points you have is the harder part. You can use your pain pattern as a guide to help you find the most likely effected muscles. It is important to find the primary trigger points which are creating the original problem, and not just treat the secondary trigger points, which are effects of the problem. I highly recommend The Trigger Point Therapy Workbook because you can uses the muscles referral pattern (i.e. the area you are feeling the pain) to guide you to the possible trigger points causing the pain. Until you are able to get the manual, try using this website to give you an idea of where your pain might be coming from. Who gets myofascial trigger points? Trigger points don't discriminate... everyone gets them! From the newborn infant to centennials... we are all afflicted. The crazy thing about them is that they often don't go away unless they are treated in some way. (Sometimes this is as easy as stretching). So people can have trigger points for 50 years or more! Why do myofascial trigger points form? It is thought that trigger points form due to a lack of energy in that part of the muscle. This can happen as a result of diminished blood flow, reduced oxygen, or local injury. Since energy is required to make a muscle relax, the lack of energy causes the muscle to get "stuck" in a contraction. 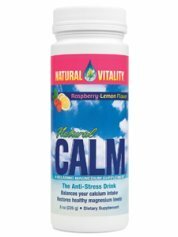 The contraction then restricts blood flow, making it even harder for oxygen to get to the area to allow energy production to resume. How does this happen in your daily life? 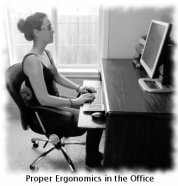 Think about when you are sitting at the computer with many muscles in a sustained contraction to hold you still and upright. When you do this repeatedly or for long periods of time, it can create trigger points. What about when you have bad posture? This makes certain muscles have to hold a continuous contraction to keep you upright. Repetitive motion can also create trigger points because the muscle doesn't have time to rest. Another mechanism for creating trigger points is trauma... when you damage a muscle, it allows the calcium "storage tanks" in it to leak out. Since calcium is the trigger for contraction in a muscle, this will create a continuous contraction, and create trigger points. Knowing how they form is important in trigger point treatment as well, because you need to stop creating the trigger points with the posture, repetitive motion, and local trauma. I have a complete page on many different treatment options to get rid of myofascial trigger points. Most of these treatment options can be performed at home. Link to Trigger Point Treatment here. Return from Myofascial Trigger Points to Trigger Point Treatment. Return from Myofascial Trigger Points to Home.